Last time I wrote about the skipped issues and made a slight mistake. I had misplaced my Ihmesarja #17 which covers the rest of the missing issues #158 onwards, so it seems I have all except one of the skipped issues from The Uncanny X-Men. Yay! The only issue I thus miss is #144 where Scott Summers/Cyclops and his current girlfriend wannabe Lee Forrester met the Man-Thing. It or some evil presense had somehow caused Lee’s father to commit suicide at the swamp where he lives… or something. Let’s be frank, the plot sounds quite arbitrary and uninteresting. Don’t worry, I’m just trying to make this sound more exciting as it is, since in the first storyline the X-Men again have to face my favourite enemy, Arcade (“Armoton”). It seems quite unlike Dr. Doom to really lower himself as low as hanging out with Arcade. Well, I suppose if you are planning to dedicate your life to dictatorship and “evilness” you can’t be too picky. In the beginning Storm and Kitty‘s dance instructor Stevie are kidnapped by Arcade’s assistant, who says she has kidnapped Jean Grey‘s parents, Moira McTaggert, Candy Southers (Angel‘s girlfriend), Amanda Stefton (Nightcrawler‘s girlfriend) and Illyana Rasputin, who is Colossus‘s younger sister and still at this point around five years old. The X-Men are told by the assistant they have to save Arcade, imprisoned by Dr. Doom, and make sure Dr. Doom will no longer bother Arcade if the X-Men want to see their loved ones alive. Well, instead of trying to free their friends from Arcade’s minion (if they can beat Arcade, how hard can his minion be? ), for some reason the X-Men decide to face Dr. Doom instead, who most likely has valid enough reason to hurt Arcade any way he chooses. As a very cunning plan Storm decides to work as a distraction, inviting herself into Dr. Doom’s castle and letting him know she has come in peace to talk with him. The other X-Men, who always like to say they just want to talk, begin an all out attack on Dr. Doom’s castle. I really don’t understand how they thought Dr. Doom wouldn’t notice a bunch of mutants fighting their way in, but for some reason, Storm seems completely oblivious of that as she dines with Dr. Doom. As an intriguing detail there are some lovely vibes in the air as the two of them dine together. Storm and Doom have dinner together. In the following story the puzzles Arcade has provided for the now imprisoned X-Men are once again just as easy to escape as in Ryhmä-X 1/1985. They just go through the walls or smash everything, and, well, problem solved. As for Storm, when she was revealed that Arcade was working together with Doom instead of being his prisoner, Dr. Doom somehow turned her into a chrome statue. In the later panels we see her clothes have been changed to another outfit. How did they do it? Did they first free her, then change her clothes and then turn her into chrome again? It would seem most likely as she is also frozen into another position than before. Also it would seem the new clothes are not chrome, which would mean they turned Storm into a chrome statue when she was naked. That raises some unnerving questions and I’d be very disappointed if no-one has written any slash on the topic… Also notice how Dr. Doom has a Storm robot made to serve him. I mean, I’m starting to see questions forming in my head I might not want to see answered. How did they manage to change her clothes? That’s a Storm-bot. If she now wears Storm’s normal outfit, does that mean she used to wear what Storm is wearing now? And why does Dr. Doom have a Storm-bot made for him? I mean – eww, Dr. Doom! Eww! But nevertheless, as Storm is kept in her chrome jail she starts to stir up a serious storm outside, which in turn will have serious consequences for Scott and Lee. But we’ll return to that story later. Once freed, Storm is pretty aggravated and almost kills everyone in rage. Luckily the others talk her out of it and peace is restored. Hurrah! What happens to Dr. Doom and Arcade? Well, it does seem Arcade really had done something wrong to Dr. Doom and he really was his prisoner. At this point the X-Men finally are ready to talk things over. The solution? They make Arcade to apologise to Dr. Doom, and everyone is happy and goes home. Seriously? No, I wasn’t kidding. They literally make him to apologise to Dr. Doom. Also notice how Dr. Doom says in the 2nd panel exactly what I am thinking: “I’d like to apologise, too.” “I am a slave to my habits. The X-Men attacked my home without clear cause so I retaliated.” I think Dr. Doom was very generous here. If someone came barging my home and broke my stuff I’d sure be more upset than he is. I’m quite impressed that he even offers to apologise to the X-Men. Surprising, considering how little upset he seems to be when Arcade owes him an apology. In 1986 the Finnish publisher for Marvel superhero comics, Semic, had to find new partners in order to keep publishing the X-Men or “Ryhmä-X” comics. Since Finland is a small market area, the publishers have always tried to find other publishing companies abroad to even out the printing costs. You see, back in the day the magazines were printed most likely using offset technique, which meant that you had to make pressplates for all the colours (red, blue, yellow, black) used in the magazine individually. Making these press plates was the most expensive part of the procedure meaning it was almost all the same how many magazines you were going to print. With joint printing expenses you could re-use the red, blue and yellow plates and only needed to have the black plate made invidually for each language, which saved lots of money. For most Finnish companies the most natural way is to search for business partners from other Northern European countries and print the magazine with them. Unfortunately, according to Mail-Man, the other northern European publishers had decided to stop publishing X-Men and thus Semic had to find new partners. They did, from the Netherlands. Unfortunately the Dutch were ahead of us and thus the Finnish magazine had to catch up with the Dutch with a compilation of all the important events. Not only did Mail-Man list some things which had happened, also the comics pages themselves were cut and pasted compilations from various comics. Peter Rasputin’s (Colossus) sister Illyana had been kidnapped to Limbo by Belasco and learned to use magic. Now she lives with the X-Men. Professor X has adopted a new group of young students called the New Mutants. The X-Men have been adventuring in space. Kitty had met Lockheed, the little dragon. Lilandra has been dethroned. Xavier has received a new cloned body, which should allow him to walk. Carol Danvers has also received new superpowers. Also the Morloks have been introduced to the Marvel Universe and Storm has defeated their leader Callisto, thus becoming their new leader. Mail-Man also lists an event that has not yet happened: Rogue asking joining the X-Men. Scott Summers has met his new girlfriend Madelyne Pryor who looks exactly like Jean Grey did. And THAT’S why I HAD to go and buy the comics from USA when I visited there last summer. I have always wanted to know how Madelyne Pryor became part of the X-Men. And since Mail-Man wrote that Madelyne was the sole survivor of a plane crash I just had to find out. But now I’m having a bit of a problem since I want to go through all the magazines they have published in Finland, but in this case the magazine is something completely different, including many noteworthy events. 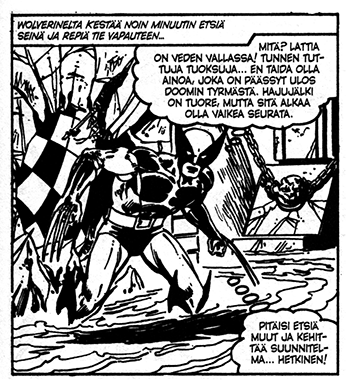 So, instead of writing about the magazine in just one post, I’m going to write many posts on Ryhmä-X 1/1986 as I read the stories which were skipped back then, and see how they were handled in the Finnish issue. 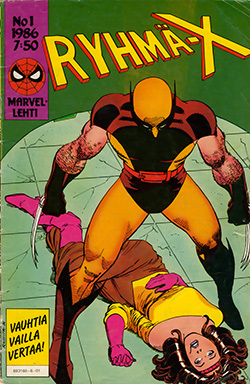 The last Uncanny X-Men story published in Finland was # 143 and it came out in Ryhmä-X 11/1985. Ryhmä-X 12/1985 included stories from different Avengers comics, so we can forget that magazine for now. 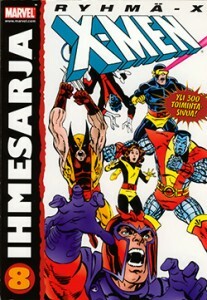 Since Ryhmä-X 1/1986 is just a compilation of many magazines, the next “true” X-Men comics in whole were printed in 2/1986 and included stories from the Uncanny X-Men #177-178. Thus we are missing issues #144-176. The Ryhmä-X 1/1986 has small pieces from issues #168, #170, #171, #173, #174, #176, and #177. However, in year 2006 Egmont Kustannus, the current publisher of Marvel comics in Finland, published some of the skipped issues in Ihmesarja #8. 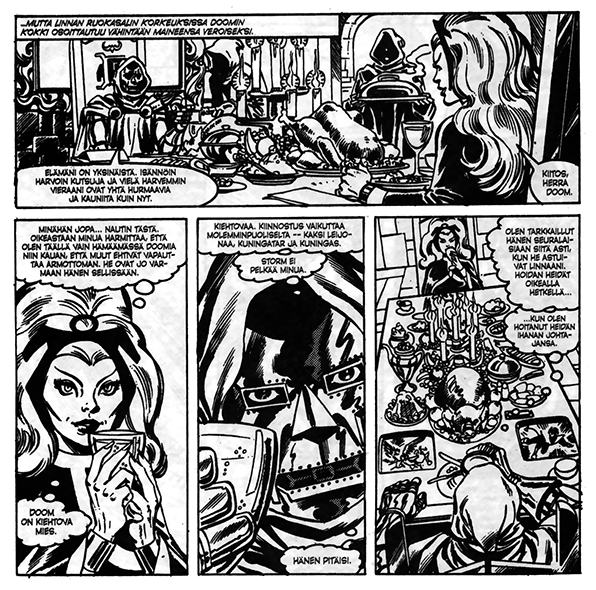 The comic book holds black and white prints of The Uncanny X-Men #145-157. 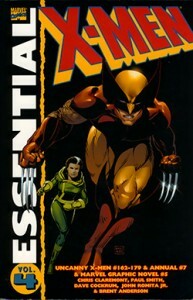 And then I have that Essential X-Men vol. 4, which I bought from the USA, which holds black and white reprints of Uncanny X-Men #162-179, Annual # 7, and Marvel Graphic Novel #5. The coverage of the skipped issues. Thus I’m happy to say I have almost all the missing issues. But the most important point is that I have the book which holds Madelyne Pryor’s first appearence and that’s all that counts. So welcome to follow the nearly lost stories of Ryhmä-X!